* Convert/transfer videos to iPad, iPhone, Apple TV, Android, Windows Phone 8, and more. * Convert AVCHD MTS/M2TS to 3D, HD/SD videos formats. * Utilize all cores to speed up encoding process – 50% faster than before. UFUSoft AVCHD Video Converter as the best AVCHD/AVCHD Lite Converter, MTS/M2TS Converter, XAVC Converter is the best solution for Sony, Canon, Panasonic, JVC, Leica, etc users to transcode and convert 1080p/1080i/720p AVCHD, AVCHD Lite, MTS, M2TS, XAVC videos to all common formats AVI, MP4, WMV, MKV, FLV, MPG, MOV, VOB, 3GP and more. With the UFUSoft AVCHD Converter, you can transcode and convert AVCHD/AVCHD Lite footages to editable format for various video edit programs Sony Vegas Pro, Adobe Premiere, Avid Studio, Windows Movie Maker, Pinnacle Studio, Cyberlink PowerDirector, DVD Maker, etc; with this professional AVCHD MTS/M2TS Converter, you can convert AVCHD/AVCHD Lite MTS, M2TS files to playable format for different multimedia devices iPad Pro, iPad Air/iPad Mini 4, iPhone 6s/6s Plus, iPhone 6/6 Plus, iPod Touch 5, Samsung Galaxy Series, Sony Xperia Series, Nokia Lumia Series, PS3/PS4, Google Nexus Series, PS Vita, Transformer Pad TF300, Apple TV/ATV2/ATV3, HTC One X, Asus PadFone, Transformer Prime, Microsoft Surface Tablet etc. UFUSoft AVCHD Video Converter supports batch convert AVCHD, AVCHD Lite, MTS, M2TS, TRP, TP, TS, MOD, TOD, MOV, video to AVI, WMV, DV, MOV, FLV, MKV, MPG/MPEG, RM/RMVB, SWF, 3GP, M4V, 3G2, XVID, DIVX, HD video etc. 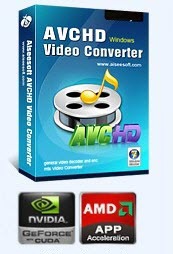 This UFUSoft AVCHD Video Converter also supports AVCHD 3D videos recorded by some 3D camcorders. With it, you can easily switch different 3D modes (Anaglyph 3D, Side by Side 3D, Top and Bottom 3D) to fit your media player. Also it supports converting 2D AVCHD videos to 3D files with wonderful 3D effect. Then you can revisit the happy hours with more vivid feels. UFUSoft AVCHD converting tools supports extract audio from AVCHD files and save as AAC, AC3, AMR, M4A, MKA, MP3, MP2, WAV, WMA, AIFF. AVCHD tool allows us to import AVCHD files to Apple TV, PSP, iPad, iPod, iPhone, BlackBerry, Nokia, Samsung Galaxy, Sony Xperia, Mobile Phone etc for playing and also upload AVCHD video to Youtube, Facebook etc metacafe on Windows 7, vista, xp. UFUSoft AVCHD converter also supports Clip(set start and end), Crop(set aspect ratio 16:9/4:3), Merge(join several AVCHD files into one), Apply effect(adjust brightness, contrast, and saturation etc), set output parameter(adjust resolution, Frame Rate, Encoder and Bitrate ), Snapshot, Rotate etc. UFUSoft AVCHD software support convert several video files at once and make one DVD on nero with fast speed and best output video and audio quality. Concise guidance, free online email support service and friendly user interface etc in avchd converter make everything easier. * Panasonic: Panasonic HC-X920/HC-V720/HC-V520, Panasonic HC-X900/HC-X800/HC-V700, Panasonic HC-V110, Panasonic HDC-MDH1, Panasonic HC-W850/HC-W850M, Panasonic HC-V750/HC-V750M/HC-V730, Panasonic HC-V550/HC-V550M/HC-V530, Panasonic HC-V250/HC-V230/HC-V130, Panasonic AG-AC7, Panasonic Lumix DMC-GX7, Panasonic Lumix DMC-FZ70, Panasonic AG-HMC150, Panasonic AG-HMC40, Panasonic AG-AC160A, Panasonic AG-AC130A, Panasonic Lumix DMC-GM1, Panasonic HC-V201, Panasonic HDC-Z10000, Panasonic AG-HMC80, Panasonic AG-AC8PJ, Panasonic AG-3DA1, Panasonic AG-HMC70U, Panasonic HDC-TM900/HS900/SD900/SD800, Panasonic TM700, HS700, SD700, Pansonic HDC-SD5, Lumix DMC-ZS7, Lumix DMC-Gstrong, Panasonic HDC-SD100, Lumix DMC-FZ200, Lumix DMC-ZS10/TZ20, Lumix DMC-FX77/FX78, DMC-TS3, DMC-FZ45/47/48, Lumix DMC-GF2, DMC-G3/GF3, Lumix DMC-TZ30, Lumix DMC-G5, HDC-SD60, AG-HVX200; AG-HVX200A; AG-HMC70, HDC-TM350; AG-HMC40, Lumix DMC-G10, Lumix DMC-FZ100, DMC-TZ10, Lumix DMC-GH2, DMC-GF2, Lumix DMC-ZS7/TZ10, DMC-G2, DMC-GH1, DMC-ZS3/TZ7, DMC-TS1/DMC-FT1, DMC-FX75, etc. * Hitachi: DZ-BD10HA. * LEICA:LEICA D-LUX 6, LEICA D-LUX 5, LEICA V-LUX 2. Supported editing software Sony Vegas Pro, Adobe Premiere Pro, Avid Media Composer, Windows Movie Maker, Windows Live Movie Maker, Adobe Premiere Express, Adobe Premiere Elements, After Effects, Magix Movie Editor Pro, Corel Video Studio ProX 3, Pinnacle Studio, CyberLink PowerDirector, etc. Supported Media player Apple TV/ATV 2/ATV 3, PS3/PS4, PS Vita, Google Nexus 7 Tablet, Nook Tablet, iPad/iPad2/the new iPad 3/iPad Mini 2/iPad Air/iPad Pro, Motorola Xoom/XOOM 2, iPhone 4/4s, iPhone 5c/5s, iPhone 6/6 Plus, iPhone 6s/6s Plus, iPod Touch 5g, Asus Transformer Pad TF300, Samsung Galaxy Tab/Galaxy Tab 4, Galaxy S4, Galaxy Note 3, LG G2 Pro, Sony Xperia Series, Nokia Lumia Series, Asus Eee Pad Transformer, Amazon Kindler Fire, Microsoft Surface Tablet, Windows Media Player, Windows Media Center, QuickTime Player, BD/DVD Player, HD TV, WD TV, Popcorn Hour, etc.